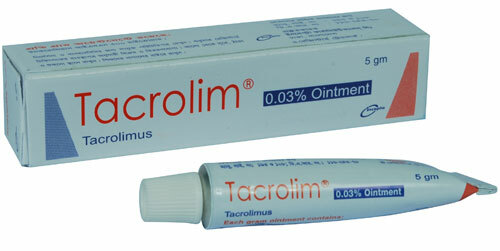 Tacrolim 0.03% Ointment: Each gram ointment contains Tacrolimus INN 300 mcg. 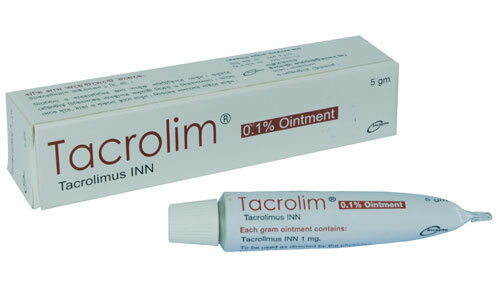 Tacrolim 0.1% Ointment: Each gram ointment contains Tacrolimus INN 1 mg.
Tacrolimus is a macrolide immunomodulator produced by Streptomyces tsukubaensis. It has been demonstrated that Tacrolimus inhibits T-lymphocyte activation by first binding to an intracellular protein, FKBP-12. A complex of Tacrolimus-FKBP-12, calcium, calmodulin, and calcineurin is then formed and the phosphatase activity of calcineurin is inhibited. This leads to a general decrease in the entire inflammatory cascade. Tacrolim ointment is indicated for short-term and intermittent long-term therapy in the treatment of patients with moderate to severe atopic dermatitis in whom the use of alternative, conventional therapies are deemed inadvisable because of potential risks, or in the treatment of patients who are not adequately responsive to or are intolerant of alternative, conventional therapies. Tacrolim Ointment is also indicated in other skin conditions such as chronic cutaneous graft-vs-host disease, hand and foot eczema, allergic contact dermatitis, psoriasis, lichen planus, facial lichen, vulvar lichen sclerosus, pyoderma gangrenosum, leg ulcers in rheumatoid arthritis, steroid-induced rosacea & alopecia areata, annular erythema, chronic actinic dermatitis and recalcitrant facial erythema. Apply a thin layer of Tacrolim ointment onto the affected skin areas twice daily and rub in gently and completely. Treatment should be continued for one week after clearing of signs and symptoms of atopic dermatitis. The safety of Tacrolim ointment under occlusion which may promote systemic exposure has not been evaluated. Tacrolim ointment should not be used with occlusive dressings. Topically applied Tacrolimus ointment have very few and rare type of side-effects including skin burning, pruritus, flu-like symptoms, allergic reactions, skin erythema, skin infections, headache, etc. Cautions should be exercised while treatment with Tacrolimus ointment in patients with atopic dermatitis predisposed to superficial skin infections. The safety of Tacrolimus ointment has not been established in patients with generalized erythroderma. Pregnancy: Category C- There are no adequate and well-controlled studies of topically administered Tacrolimus in pregnant women. The experience with Tacrolimus ointment when used by pregnant women is too limited to permit assessment of the safety of its use during pregnancy. Nursing Mothers: Although systemic absorption of Tacrolimus following topical applications of Tacrolimus ointment is minimal relative to systemic administration, it is known that Tacrolimus is excreted in human milk. Because of the potential for serious adverse reactions in nursing infants from Tacrolimus, a decision should be made whether to discontinue nursing or to discontinue the drug, taking into account the importance of the drug to the mother.